Blue and Yellow Damselfish comes from the Indo-Pacific region. Very popular in the marine aquarium hobby in India. It is top electric blue, and bottom and the tail are yellow. Similar like other damsel fish it is also aggressive in nature. Found at a depth range of 20 m and can grow to a size of 3.5 inches in length. Requires a bit of hiding spaces in the rock work. There are so many damsel fish in the market it is sometimes confusing about the type of damsels. Blue and Yellow Damselfish are often confused with the Similar Damselfish or the Alleni Damselfish. They are different but all are from the same family Pomacentridae. Having the same traits of being aggressive so choosing tank mates of semi-aggressive nature is recommendable. 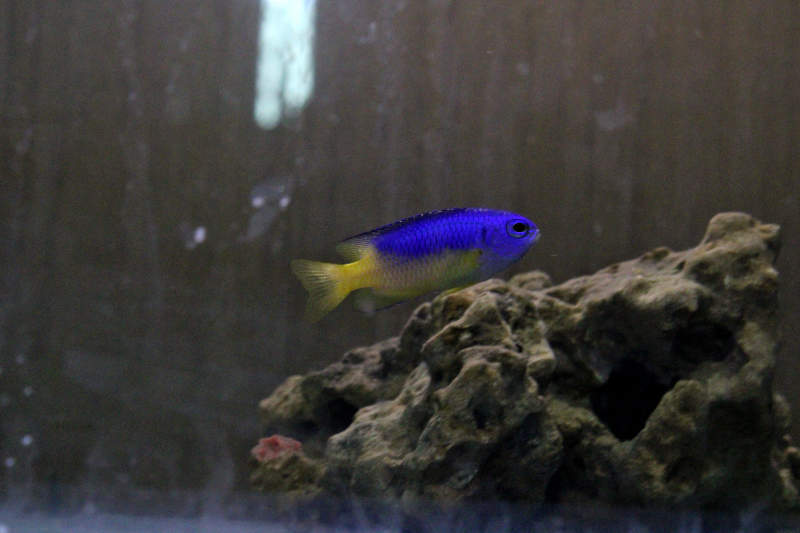 Blue and Yellow Damselfish is a great addition to any reef tank and doesn’t require large system. They often seen shy in the beginning but with maturity start harassing the other peaceful tank mates. I have noticed they do extremely well with fish like the angelfish or the triggers. They would swim freely in tank and as soon they see larger fish approaching, they are gone hiding. Would again surface as soon they feed no danger. They whole hide and seek activity is fun to watch. They are pretty hardy and would feed on both the pellets and flake food. If you are looking for more about the Pomacentrus coelestis.